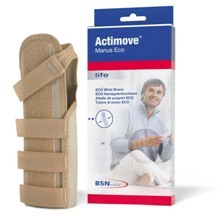 Actimove® Manus Eco wrist brace Provides stabilisation of the wrist without restriction of hand function. Inflammatory conditions, soft tissue injuries, and overuse injuries. High coverage of dorsal aspect of the hand - Better support to restrict wrist extension. Prevents swelling at the dorsum of hand. Elastic material - Easy fit around the wrist and the arm.